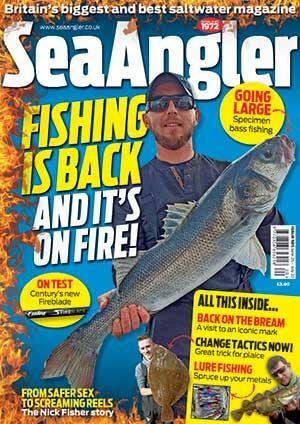 I hear lots of anglers are turned off plugging for bass because they reckon it is too difficult to do properly. What a load of rubbish! It's dead simple if you follow a little logic. It would be stupid of me to say that plugs result in bass lining up to get caught, although if you recognise what these fish want then you are taking your first faltering steps along that well-trodden path to angling enlightenment. First things first. Don't believe any of this tripe that bass are hard fish to catch. Find them feeding and you will clean up. When bass are aggressive they attack with unbelievable ferocity. There is nothing subtle about bass on the attack. Unlike a mullet, which can bring frustration, or the passive nod of a cod, we are talking about a true predator on a leash once it is hooked. Catching bass is the easy part of the hunt, finding them though isn't quite so simple. We aren't talking about blind baitfishing here, but angling by sight, casting high-tech bits of shaped plastic at fish we can clearly see. This has to be the ultimate high in sea angling circles. You have minimum tackle, you have tracked down a fish or shoal and there they are swimming right in front of you. Can you imagine that? There are plenty of marks where bass will hit lures, but you need to search out certain kinds of terrain to fish with surface poppers and shallow diving subsurface plugs. If you pinpoint areas with plenty of submerged rocks, weed and gullies that are slowly exposed with the ebbing tide, then this is where the bass will hunt. They like to use cover and stealth to kill their unfortunate prey and bass will often work incredibly close to shore. Many areas along the South Coast offer these kinds of marks, as do Devon, Cornwall, Wales, the Channel Islands, and, of course, Ireland. It's a bit of a generalisation, but if you don't have the time for endless experimentation, ignore rock marks that drop off into dark depths. Instead concentrate on places where you can see the underwater features through a pair of Polaroid sunglasses. Investigating during big spring low tides will reveal any number of places to fish. Those marks that have plenty of rocks and weed still under relatively shallow water when the tide is right out will be worth a serious go at low water as well. Sometimes you will stumble on a place that just shouts bass. It doesn’t need to be extensive because the fish will often work tight areas at certain stages of the tide and weather conditions. Working a lure at a fish obviously means it has to see it, so most bass anglers I know don't like too much colour in the sea if they want to be successful. Gin-clear water and very settled conditions can put the fish down, but a little chop and life to the sea often signals good fishing. If you get into this kind of situation you will start to learn just how close bass can be to you at times, which is why you have to keep noise and movement, especially shadows, down to a minimum. I have also been amazed at how bass can hit a lure in rough conditions, but you only have to look at one to see how athletic it is to realise the species is very capable of dealing with strong tide. THE world is your oyster when it comes to rods, but steer away from carp rods because I don't believe they make nice spinning rods. There are some good value-for-money 9ft-10ft spinning rods that do a great job of casting and working a plug. I am looking for a rod that has feel, can launch the lure a good distance, then subdue the fish and also transmit as much feeling to my arms as possible. Lightness is vital because you will be casting and retrieving all day long. Small bait-casting multipliers that originate from the US, and designed for the large-mouth bass market, can work well, but for ease of use and lack of hassle I look to use a fixed-spool reel. Again, spend what you want, but there are two points here, either spend a lot on a top-of-the-range reel and reap the benefits or spend less on a model that is nearly as good, use it hard, trash it without fear and then simply buy another one when the need arises. Some anglers swear by braid for plugging, but others cry foul and always use mono. I can see the pros and cons for both, but remember that braid needs to be continually checked and upgraded if you fish around rocks. Braid's directness is useful for plugging, but mono will always offer a safety factor in its stretch. I tend to use 20lb or 30lb braid and a 30lb mono leader, or 15lb mono and the same leader. Most fixed spools come with a spare spool and I tend to carry one with braid and one loaded with mono. Remember to underfill the reel with braid, which will prevent wind-knots. POPPERS and other surface plugs create disturbance to attract fish, while some spit water out from the face of the lure and some can be worked in a pattern, often called walking the dog. Storm Chug Bugs and Yo-Zuri Mag Poppers are worth using. Surface plugs are useful for very shallow water where sub-surface lures might get snagged. Not much beats the serious thrill when a bass comes up and smashes at a lure on the surface. Work lures hard around structures, eddies, gullies, weed beds and hidden rocks, varying the rate of retrieve until you find a fish. 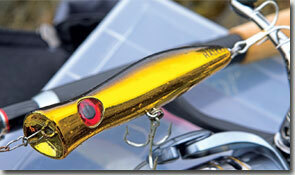 A popper allows you to visually cover large areas of water and, usefully, they often cast like bullets into the wind. Watch for the odd times when the trebles tangle up and stop the lure working properly. Some lures are designed to fish at a foot or two under the surface, like the sadly-missed original Storm Jointed Thunderstick. Others, like the Yo-Zuri Crystal Minnow, work well and are useful when you are fishing a greatlooking snaggy, shallow mark. When using a shallow water lure you often see the boil of the bass just seconds before it slams into the hooks. If you miss the fish, either stop the lure for a second or two because it may return to nail it or cast out again in the same area. Some anglers like to carry loads of lures, but many catch more anglers than fish. Plugging is a lot to do with confidence. Find the lures that work for you and chances are you will keep catching on them. You work harder and in a better rhythm with lures that you know take fish. 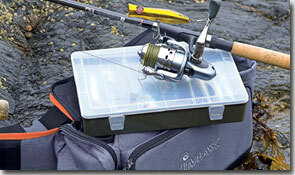 Chest waders are great for plugging because they allow you to reach more fishing ground. I know some people who wear wetsuits in the warmer months and really push further out, but you need some experience to do this safely. Then there is kayak fishing, but that’s another story. If you can't fit your gear into a small rucksack or specially designed bum-bag then you are carrying too much. Embrace lure fishing as a chance to travel light, with your fishing rod in your hand. Not much can beat that totally-exhausted feeling after a day's rock hopping, wading and working plugs, especially when a good bass has nailed your favourite plug. For more information on bass, click here.